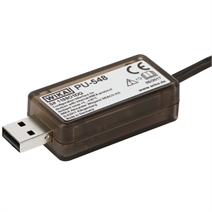 With this model PU-548 programming unit, digital temperature transmitters and compact thermometers with integrated transmitter using the WIKA-internal protocol can be configured quickly and very easily. The programming unit provides a clear status/diagnostic display and checks, for each contact, the connection from programming unit to PC and the transmitter. A bright LED in the transparent case indicates to the user the current status of the connection. This ensures that faulty connections are recognised immediately. Together with the WIKAsoft-TT configuration software, a perfect tool is available, with which one can configure temperature transmitters or compact thermometers very easily and outstandingly quickly. The electrical connection of the terminals for the configuration of the head-mounted temperature transmitter version is achieved using the magWIK quick connector (Patent, property rights registered under No. 102009044676.1). For the connection to the compact thermometers with coupler connectors, suitable adapter cables are available.